If you have high blood pressure or are at risk, you may be concerned about the sodium in your drinking water. The Centers for Disease Control and Prevention estimates that one in three American adults has high blood pressure. The average American consumes 3,436 mg of salt each day, far higher than the 2,300 mg recommended by the U.S. Department of Health and Human Services. About 5 percent of your salt intake comes from cooking. Installing a water filter to remove sodium may help you cut back on your salt intake. Salt gets into your drinking water through natural processes involving rain and erosion. Rain is slightly acidic with a pH of about 5.6, explains the U.S. Geological Survey. When the rain falls on rocks, it begins to erode the surface, releasing salts into the environment. Salts reach your drinking water through runoff into waterways. Just under two-thirds of the public water supply comes from surface water such as lakes and streams, hence the opportunity for salt to enter the drinking water supply. 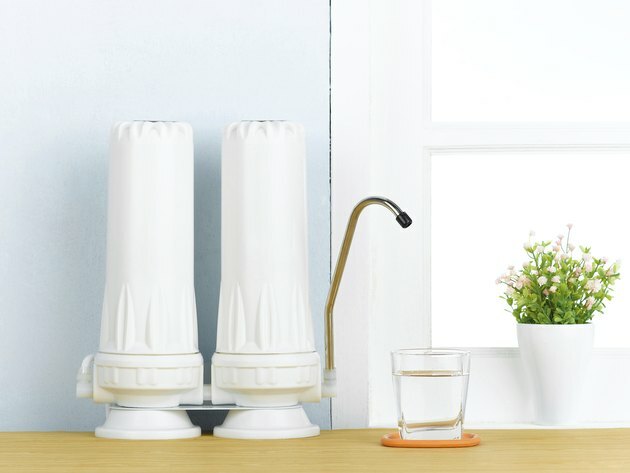 You have several options for filtering salt from your drinking water. Reverse osmosis systems filter water by forcing the water through a semi-permeable membrane. It can remove organic and inorganic compounds as well. Ion exchange systems swap sodium and other chemicals for other neutral molecules. Another option is distillation. This process involves heating the water and collecting the condensed steam. Because salts are heavier chemically than water, they do not become part of the steam. Every water treatment system has its advantages and disadvantages. While reverse osmosis systems remove sodium, they require regular maintenance for optimal performance. Ion exchange systems also require maintenance to prevent the development of bacteria within the system. Distillation, while very effective, requires electricity to operate. The system produces clean water slowly, which may not be appropriate in all cases. Water softeners represent a conflict between having soft water and ensuring sodium-free water. You may install a water softener to remove excess calcium and magnesium from your water, explains the National Sanitation Foundation. However, softening water involves replacing the calcium or magnesium ions with sodium or potassium. The harder your water, the more sodium will end up in your drinking water, advises the Mayo Clinic. Though the amount is minimal, it still may pose a concern if you are on a limited-salt diet. Your best solution may involve using two types of water treatment systems. If hard water is an issue, install a water softener, but only for hot water rather than for cold water so that your cooking and drinking water are unaffected. To further remove sodium, you can install a secondary water treatment system to remove sodium and any other contaminants of concern. Your home improvement center or plumbing professional can provide further information regarding an appropriate set-up for your home.